Make learning and reviewing Adaptations and Natural Selection concepts and vocabulary more fun! 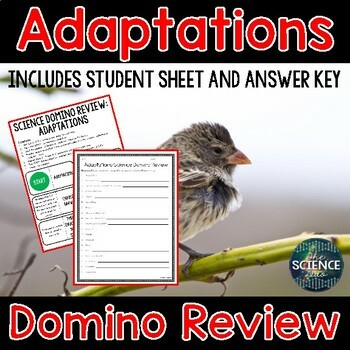 This interactive and engaging activity focuses on Charles Darwin, instincts and learned behaviors, types of adaptations (structural, behavioral, and physiological), camouflage, and much more important vocabulary from your Adaptations Unit. This activity is perfect for small group instruction, partner work, stations/rotations, or independent study. Save $$$ by purchasing the bundle! We like to print all of the Domino cards on cardstock and get them laminated. We place the completed sets in plastic bags to be used multiple times. You may choose to print a set for each student and allow students to cut and sort individually. You may also decide to create the sets and place in bags for your students ahead of time. This activity will work well with whatever fits your need the best. 1. 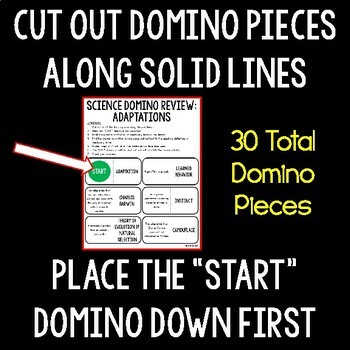 Print all of the Domino cards (create sets for groups or allow students to work individually) and a Student Answer Sheet for every student. 2. Cut out all of the domino pieces along the solid lines. 3. Place the “START” domino piece down first. 4. Read the question, definition, or vocabulary term on the domino. 5. Find the answer on another domino piece and match it to the question, definition, or vocabulary term. 6. Repeat Steps 3-4 until all of the domino pieces have been used. 7. 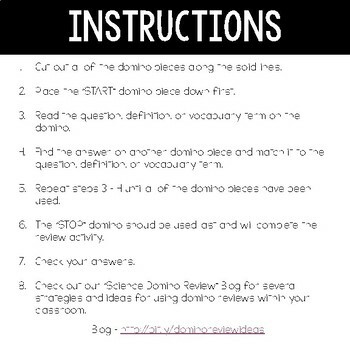 The “STOP” domino should be used last and will complete the review activity. 8. Record answers on the Student Answer Sheet. 9. 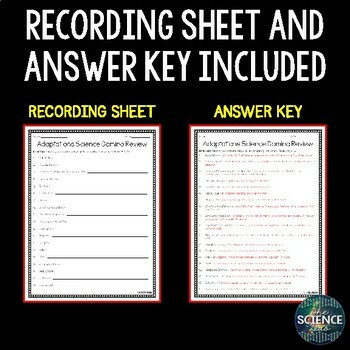 Check answers with Teacher Answer Key.